During the summer after their first year of theological studies, students attend a four-week intensive program in spiritual formation (IPSF A) that focuses chiefly on the human and spiritual foundations necessary for a healthy life in the Spirit. This experience concludes with a five day silent directed retreat. At the conclusion of their parish internship experience, students participate in another four-week intensive program in spiritual formation (IPSF B). This includes a week long debriefing of the parish internship, a rather thorough examination of various aspects of a healthy and integrated diocesan priestly spirituality, and a five day silent directed retreat. 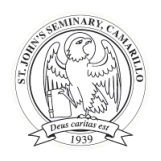 Both of these programs are held on the campus of St. John’s Seminary and are marked by significant amounts of time for reflective spiritual reading and solitude with the Lord. Each year a five-day Seminary-wide retreat is provided. In addition, monthly days of recollection are scheduled throughout the year by the Spiritual Formation Team. While most of these days of recollection are held on campus for the entire Student Body, each year a day is set aside for each class to have a day of prayer together, which the members of the class plan and finance themselves under the supervision of the Spiritual Formation Team. There is also a personal Day of Recollection set aside for the seminarians during Holy Week. Participation in the annual retreat is required of all students. The only exceptions to this required participation are those students who are preparing for ordination to the deaconate or to the priesthood. Each year the Seminary sponsors one group retreat in preparation for ordination to the diaconate and one group retreat in preparation for ordination to priesthood. While arrangements for both retreats are made by members of the class, the choice of retreat master and location are made in communication with the Director of Spiritual Formation with the approval of the Rector. The dates for these retreats are normally included in the annual Seminary calendar. When necessary, another time for the retreat may be arranged in consultation with the Director of Spiritual Formation with the approval of the Rector. The Seminary provides funds for a stipend for the retreat master and for the retreat house fee in a reasonable amount to be determined each year by the Director of Spiritual Formation. The class representative can obtain these funds through the Director of Spiritual Formation. Unless a special scheduling of their ordination necessitates another arrangement for a retreat, those preparing for ordination for the Archdiocese of Los Angeles are expected to attend the group retreat sponsored by the Seminary. All others preparing for ordination are welcome to participate in this group retreat. Those individuals or groups not preparing for service to the Archdiocese of Los Angeles and who do not participate in the group retreats sponsored by the Seminary, will look to their own bishop or religious superior both for funding and for approval of their retreat plans. In the case of the retreat in preparation for diaconate, those not participating in the retreat sponsored by the group will inform the Director of Spiritual Formation of their plans of making a preordination retreat.